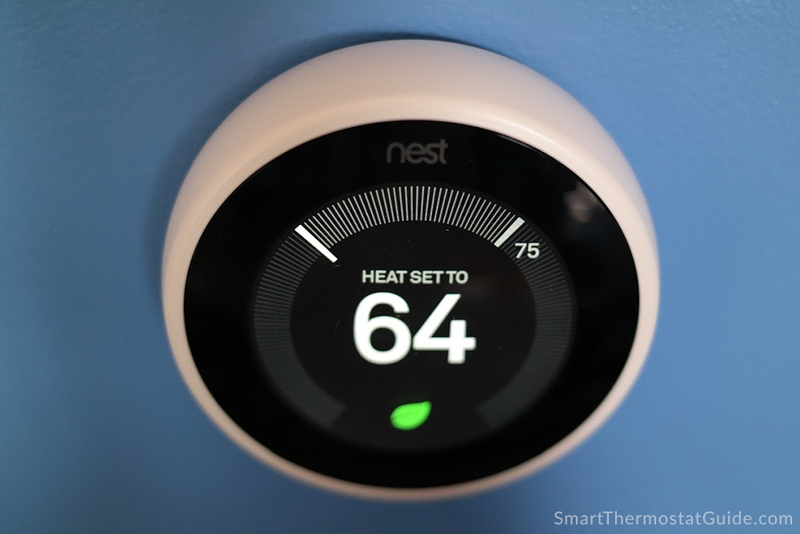 Google’s third generation Nest hardware hit stores just in time for the 2015 holiday shopping season. Now that the dust has settled, let’s take a look at what’s new. 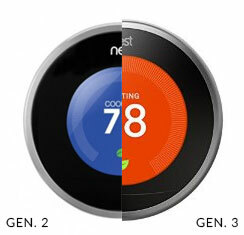 What’s new with the 3rd generation Nest? The display is noticeably larger and higher resolution than previous Nest generations. Pixels weren’t really noticeable on previous Nest displays, but the ppi update on the Nest 3 makes them all but invisible. It detects your presence from further away – about 10 feet instead of the previous 3 feet – thanks to a new hardware feature aptly named Farsight. Three ring colors to pick from: copper, white, and stainless steel. Nest’s gen 3 offers a noticeable increase in screen size (with a barely noticeable increase in hardware size). 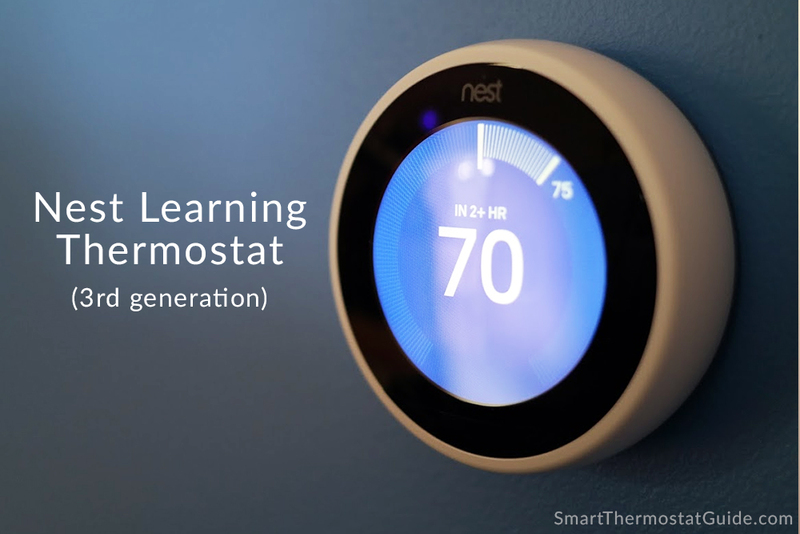 The true strength of the Nest Learning Thermostat (of any Nest thermostat, really) is its integration with an ever-increasing collection of home automation products. To buy a Nest is to buy into a family of products that can work together. For example, if your Nest Protect smoke/CO detector is triggered, your Nest thermostat will automatically stop sending signals to your furnace. It depends on what you already have and how badly you want the new features. There’s no killer feature in the Nest 3, and it’s a mild product refresh at best. If you don’t have a smart thermostat already and you’ve always had your heart set on a Nest, this is the best Nest yet – go for it. It’s definitely not worth switching over from our top pick, the Ecobee 3, and if all you really want is a bare-bones WiFi thermostat (and don’t mind plopping down less than half as much cash), check out the Emerson Sensi. For being the third generation of an industry leading piece of hardware, I (and some other reviewers) can’t help but notice the lack of whiz bang excitement in the Nest 3rd gen. It’s more like they’re just keeping it modern than revolutionizing the industry the way they did a few years back. Hey, that’s not so bad – I love when my favorite band releases a new album that stays true to the sound I love them for. Something to help you keep an eye on the “big picture” in your home. Ecobee introduced the concept of room-specific temperature sensors with their Ecobee 3, giving users a better understanding of room temperatures throughout their homes. These little sensors have proven essential to Ecobee 3’s enduring popularity. Some users find that their Nest has an unfortunate tendency to slip into “Away” mode at inappropriate times because it doesn’t detect anyone walking by it in its out-of-the-way location. *2018 update* Nest rolled out an optional room temperature sensor accessory this year! This is great news for Nest owners with a bit of ecobee envy. The room sensors only detect temperature, so they’re best suited for homes where the thermostat itself is in a less-than-ideal location and you’d rather gather temperature data from somewhere else in your house. They don’t help with detecting occupancy. More display options for the wake screen. The Nest 3 can be awoken from much further away thanks to the new Farsight feature, but many users wish they could see their home’s current temp (not the target temp) on this idle screen. And that limitation is by design, apparently (probably not for long, though, given the sheer amount of complaining on Amazon). If your home lacks central air, you’ll be treated to a display of the word “Farsight” when you trigger the device from afar – that’s rather boring. (My home doesn’t have central air. 🙁 ) This isn’t catastrophic. You can see your home’s actual temp on the device up close or in the app at any time. I think it’s more likely that Nest’s RTFM-esque response to customer requests is rubbing customers the wrong way. HomeKit & Siri support. Nest is owned by Google, so no surprise that Nest lacks HomeKit and Siri support, but this veteran of the 90’s PC vs. Mac wars is just super tired of this crap. I’d hate to see home automation (devices that presumably get sold and bought along with your home) get split into two competing proprietary camps. Boo, hiss! It’s a marginal update but Nest is still an excellent smart thermostat. If you always wanted one, you have this anonymous Internet person’s permission to go get one. 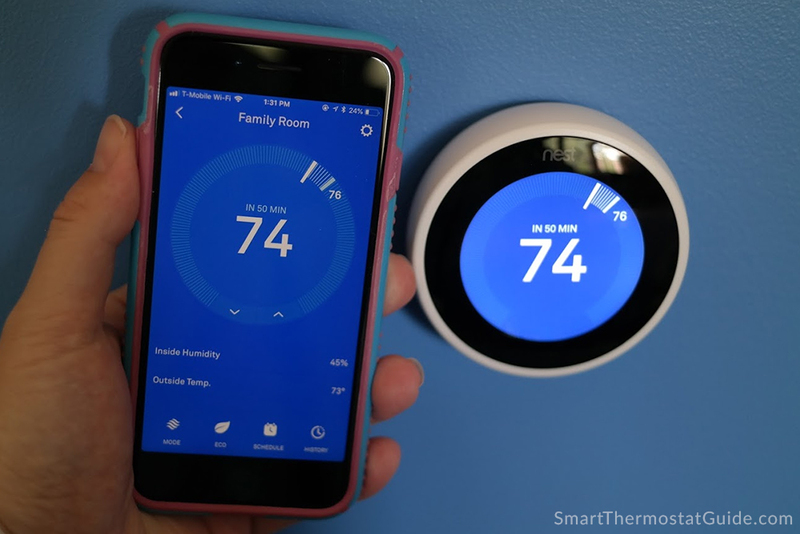 The best reasons to buy a Nest Learning Thermostat are to buy into the larger Nest family of home automation products and to take advantage of the “learning” algorithm. Next: Next post: Now you can control your Ecobee3 with your Amazon Echo! A larger temp swing is probably more efficient rather than less, since it means the HVAC isnt’ switching on and off as much. This is probably the reason. Spinning up fans and compressors can draw a lot of energy, and doing it every time the house changes off its temperature target by 1 degree there can be bit of of waste there. Additionally, when that extra energy is being drawn to accelerate the compressor or fan, it dips the voltage on the power line and that’s something power companies hate. When 20 houses in your neighborhood have their ACs kick in at the same time it can measurably cause the line voltage to lower even to houses that are not running their AC; the less often the AC activates the less the line voltage will dip on average, this means power companies don’t need quite as much power capacity to handle such scenarios and that means less pollution, on top of the fact the Nest already saves power by not having the AC running 24/7. But on the other hand, the higher a temperature difference between inside and outside air the proportional the rate of heat transfer, thus, by overcooling or overheating past the set threshold it can also gain or lose heat more than it normally would, that’s a bit inefficient. My guess is the Nest balances between the two. UH, NO! The Gen 3 does NOT do everything the Gen 2 does, guess how i know!? The Gen 3 lacks the T1 and T2 terminals for external 12V power this can be an issue in extended power outages where you need the A\C on as soon possible for older folks. Especially if they have hard time pulling it off the base plugging in the USB micro plug during the outage. Hey there! Are you in the UK or thereabouts? I think those terminals might be specific to your region. The Nest models covered on this site are the United States models, but I’m glad you stopped by to let us know!